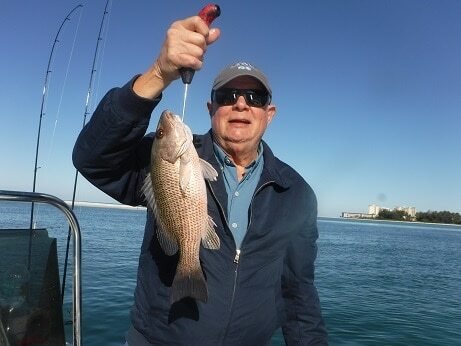 Anglers Sarasota mangrove snapper fishing experience action, tough battles on light tackle, and terrific eating! Mangrove snapper please anglers of all ages and skill levels on the inshore waters of Florida and beyond. As a full time fishing guide in Sarasota, Florida, it is my job to meet my clients expectations. Sarasota is a tourist destination and I get a lot of casual anglers. Mangrove snapper are the perfect fish for these anglers. They are quite aggressive at times, school up in good numbers, pull hard, and taste great. They are basically “saltwater panfish” with white, tasty flesh. Light spinning tackle is the best choice for anglers targeting mangrove snapper in shallow, inshore waters. A 7 foot rod with ten pound monofilament or 20 pound braided line works well. Snapper can be fussy and bite very lightly at times. Light tackle increases sensitivity, resulting in more hook-ups. If large grouper or snook are also an option, slightly heavier tackle may be in order. With snapper fishing, “less is more”. The lighter the rig, the more success anglers will have. Mangrove snapper have keen eyesight and can be finicky. A small hook will draw more strikes. In most instances, a #1 live bait hook or a #3/0 circle hook is perfect. Circle hooks are required when fishing in the Gulf of Mexico. Anglers should use the minimum weight required to get the bait down. A light leader should be used as well. A 24” piece of flourocarbon leader is a good choice. I live to use a “knocker rig”. This lets the sinker ride right up against the eye of the hook. This allows a snapper to pick the bait up without feeling any weight while keeping the bait right on the bottom. The sliding sinker with “knock” the hook off of most snaps, thus the name. ¼ ounce sinkers work fine in most circumstances. Strong currents may require more weight. 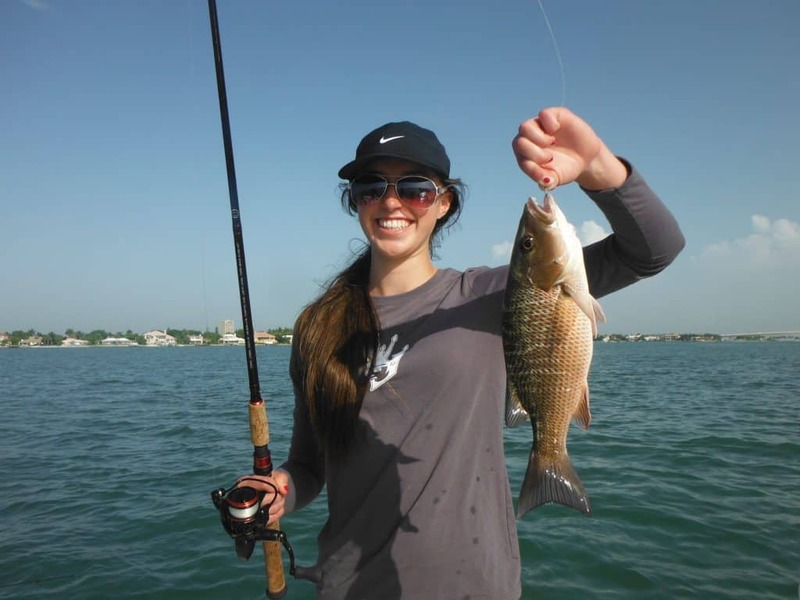 Most anglers go mangrove snapper fishing inshore using live or frozen bait. While snapper will take artificial lures, live bait is best in most applications. The number one bait in Florida is shrimp. Live shrimp is preferred, but plenty of snapper have fallen prey to frozen shrimp. Shrimp is available at every bait shop in Florida and the south east United States. Live baitfish can be a very effective bait as well, particularly for anglers seeking larger fish. A 2” live pinfish or grunt will not get as many bites, but the fish will be larger. Small bait fish such as pilchards (scaled sardines), threadfin herring, and Spanish sardines are also very good baits. The same bait fish will produce presented as cut bait. Mullet and squid are both good frozen baits that can be cut into chunks or strips and fished effectively on the bottom. 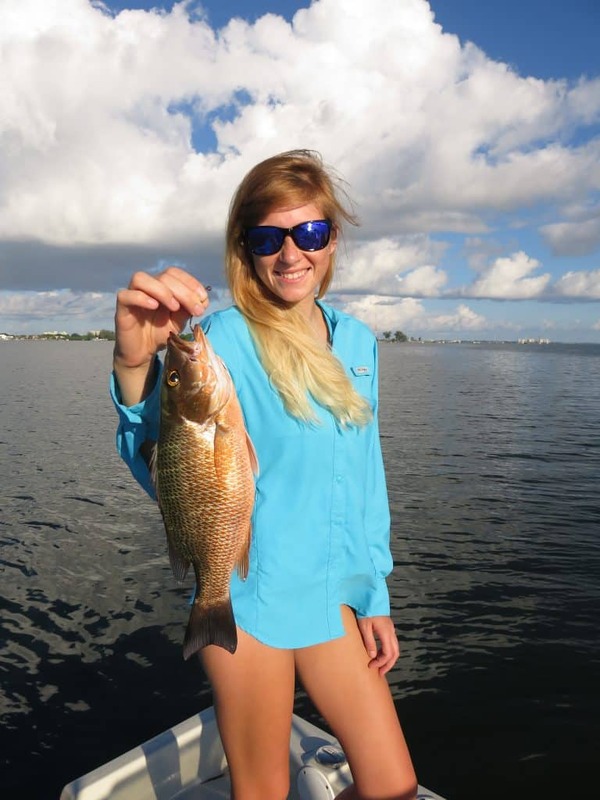 In most instances, anglers will have success mangrove snapper fishing inshore by targeting some type of structure. Bridges, docks, and seawalls are all prime examples of man made structure. Oyster bars, natural ledges, and grass flat edges are all examples of natural structure. All will hold mangrove snapper at times. Bait fish presence and tidal flow are factors as well. Passes and inlets are prime snapper fishing spots. The water is usually deeper than the flats. Also, current flow is usually present. 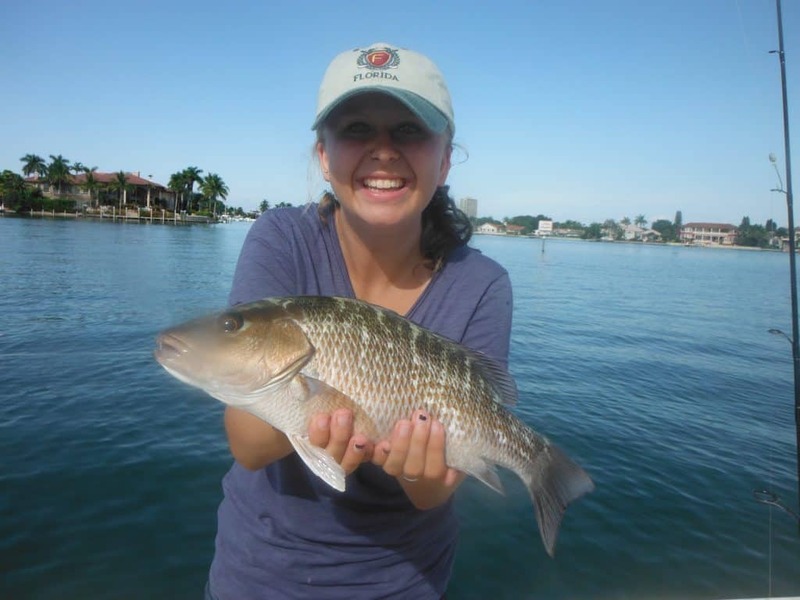 Structure such as docks and rip rap in passes and inlets will hold snapper and other species all year long. Current can actually be too strong at times. This is particularly true on the east coast where tides are stronger. Slack tides can be the best option. Bridges are mangrove snapper magnets! Bridges are generally in water around ten feet deep, which is perfect. They are also normally in narrow spots, which results in good tidal flow. Some bridges are also in “No Wake Zones”, resulting in less waking by passing vessels. Bridges also offer access for anglers without a boat to fish for mangrove snapper. Oyster bars are terrific spots to locate and catch mangrove snapper. Prime bars have a steep drop off into water that is several feet deep or more. High tide just starting to fall is the best time to fish oyster bars. Grass flats that drop off sharply are rime snapper spots as well. Here in Sarasota where I fish, there are areas that have been dredged to make fill. This resulted in shallow flats that drop off into 15 feet of water. Mangrove snapper will congregate on these edges. In the Florida Keys, there are “banks” that hold a lot of mangrove snapper. These are basically “humps” with grass that pop up in the open bays. 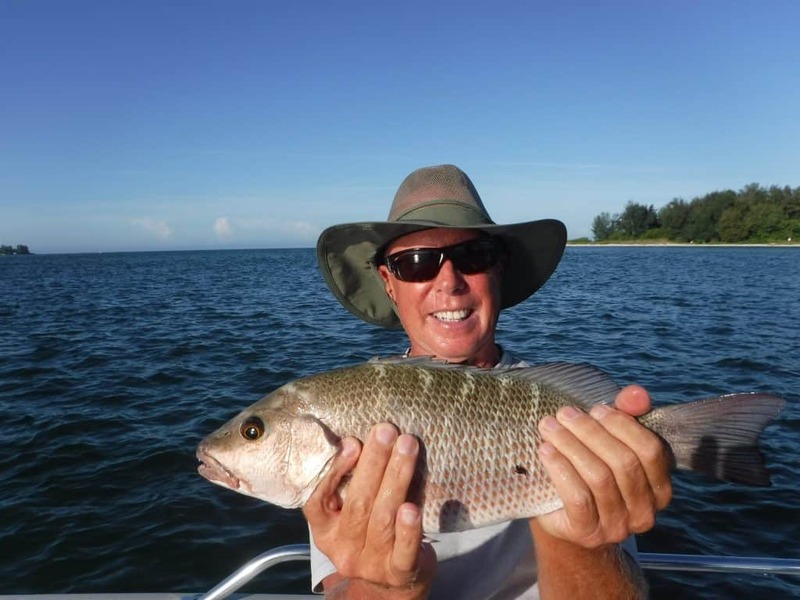 Anglers fishing for mangrove snapper with live or frozen bait will almost always anchor either up-current of the spot to be fished or directly over the top of it. In water ten feet deep or shallower, it is usually best to anchor a cast away from the structure. In water deeper than ten feet, vertically fishing can be the most effective presentation. Anchoring is a skill in itself. Wind and tide must be taken into consideration when anchoring. The worst thing an angler can do it to drag the anchor through the fishing spot. This will certainly ruin the spot. Only practice and experience will give anglers the skill they need to anchor up on a spot properly. Once the boat is anchored, it is time to fish. Live shrimp can be hooked in several ways. The shrimp can be hooked under the horn. This allows for a natural presentation, but also makes it easier for the snapper to take the shrimp off of the hook. Shrimp can be threaded on the hook as well. This works well, even though it kills the shrimp. The fresh juices will permeate the water and attract snapper to the bait. Frozen shrimp and cut bait are fished in exactly the same manner. Frozen shrimp should be threaded onto the hook. Live baitfish work best when hooked through the lips, especially if current is present. Fish can be cut into small chunks or strips. Both methods are effective. Squid work best when cut into long strips. One mistake many anglers make when mangrove snapper fishing inshore is trying to “set the hook”. Once the bait settles on the bottom, anglers will initially feel a “tap”. There may be several “taps”. It is crucial that the angler remain still and not move the bait at all. At some point the snapper will take the bait. The angler will see the rod tip bend steadily. The angler should simply reel quickly, removing the slack while the rod tip is raised up. If the snapper steals the bait, re-bait and try again! Here in Sarasota, we have experienced a very productive summer snapper bite. For whatever reason, schools of snapper showed up on the deep grass flats once the bait fish showed up on the flats. Chumming over grass flats in 6 feet to 10 feet of water brought schools of snapper up behind the boat and in an aggressive mood. Chumming is widely practiced when fishing for snapper offshore. Inshore it can be used, but it must be done judiciously. Chumming in strong tides will have the opposite effect, it will disperse the snapper instead of attracting them to the boat. One technique that is deadly is to use live bait to chum on the deep grass flats. Currents are not as strong on the open flats. This requires a lot of bait, but bait fish are usually abundant in the summer and easily caught. Sarasota has an extensive artificial reef program. Several of these reefs are within a couple miles of the beach. They hold mangrove snapper and other bottom fish. These reefs consist of concrete rubble, bridge remains, and other fish-holding structure. The three nearshore reefs are in thirty feet of water. The best approach is to anchor and fish vertically. However, when the wind and current are both light, anglers can drift the reef. Snags will become more prevalent. The reef coordinates can be found HERE. Most of the inshore Gulf of Mexico bottom consists of sand. There are some ledges and rocky outcroppings. These are fish magnets! Small ledges that get little fishing pressure can produce for many years if fished judiciously. Once a good ledge is found, anglers should search nearby, there are usually more spots in the neighborhood. While live bait works best, mangrove snapper will hit artificial lures. Most of the snapper that my clients catch on lures are done so while targeting other species. I use a #8 Rapala X-Rap when fishing for snook and other species. Since snapper share the same spots, they will be caught as well. The small plug closely resembles the small finger mullet and other bait fish that inhabit the inshore bays. Jigs will also fool mangrove snapper, especially on the deep grass flats. Scented soft plastic baits can be particularly effective. My personal favorite is the 3” Gulp! Shrimp and the color really does not matter. While I very much promote catch and release, I do not mind if clients keep a few tasty snapper for a meal. This is especially true with our resident species. These snapper are migrating out of the bays and into the open Gulf of Mexico. Snapper are delicious and can be prepared many ways. Here are a few of my favorites. They are all simple and very easy. Florida snapper regulations are found here. A skillet is warmed up to a pretty good temperature. Snapper fillets are dipped in melted butter or olive oil and seasoned to taste with blackening seasoning. The fillets are then cooked for 3 minutes or so on each side. Fish have been fried for a long time! Fillets are covered in a commercial or home made coating and then fried in 350 degree oil. Snapper are placed on a baking sheet and covered with Italian bread crumbs and placed into a 400 degree oven for 8-10 minutes. 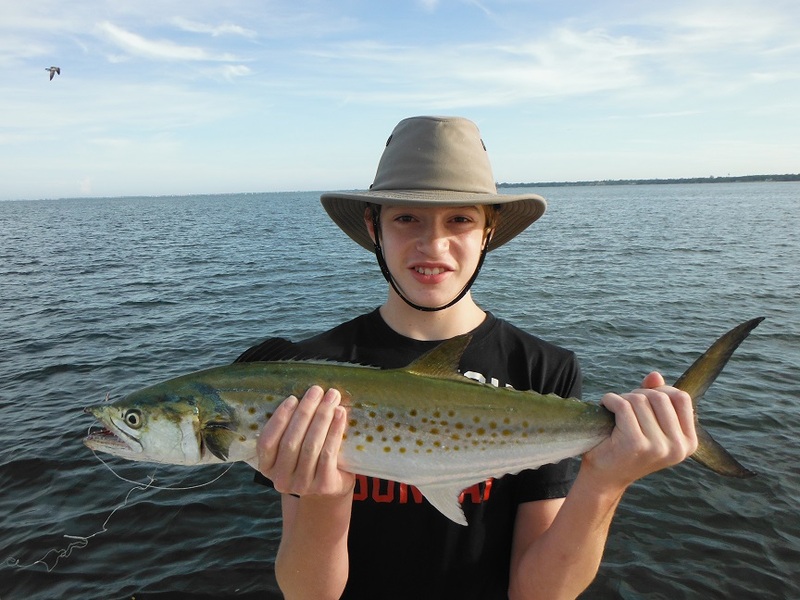 Anglers very much enjoy Sarasota Spanish mackerel fishing! Spanish mackerel are aggressive, fight very hard, are one of the fastest fish in the sea, and taste great when eaten fresh. What more could an angler ask for? It is one of the favorite species of clients on my Sarasota fishing charters. 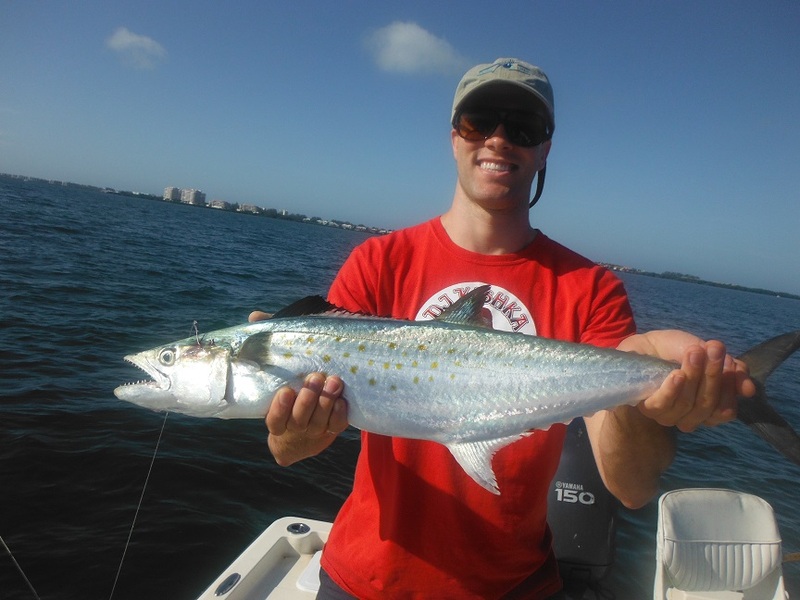 Atlantic Spanish mackerel is the species that Sarasota, Florida anglers will catch. They migrate up the east coast as far as Cape Cod. They will cover the entire Gulf Coast. Anglers catch Spanish mackerel using a wide variety of baits and techniques. These will be covered in this article on Sarasota Spanish mackerel fishing. Spanish mackerel average 2 to 5 pounds in Florida. Therefore, spinning tackle is usually the best choice when pursuing them. The lures and live baits often used when fishing for mackerel can be quite light. Long cast can be required at times as well. While conventional tackle can be used, especially when trolling, spinning tackle works best in most applications. The same inshore spinning outfits that most anglers use for snook, redfish, and speckled trout will work well when targeting Spanish mackerel. A 6 1/2 foot to 7 foot fast action rod combined with a 3000 series spinning reel is a great all around combo. I prefer monofilament line when targeting Spanish mackerel. I feel that the stretch in the line can actually be beneficial as these fish are so fast and pull so hard. Some type of leader will be required when fishing for Spanish mackerel. They have very sharp teeth, and cutoffs will occur. While steel leaders will reduce or eliminate cutoffs, they will also reduce strikes. This is especially true in a clear water that Spanish mackerel prefer. A good compromise is to use a 30 inch piece of 30 pound to 40 pound fluorocarbon leader. 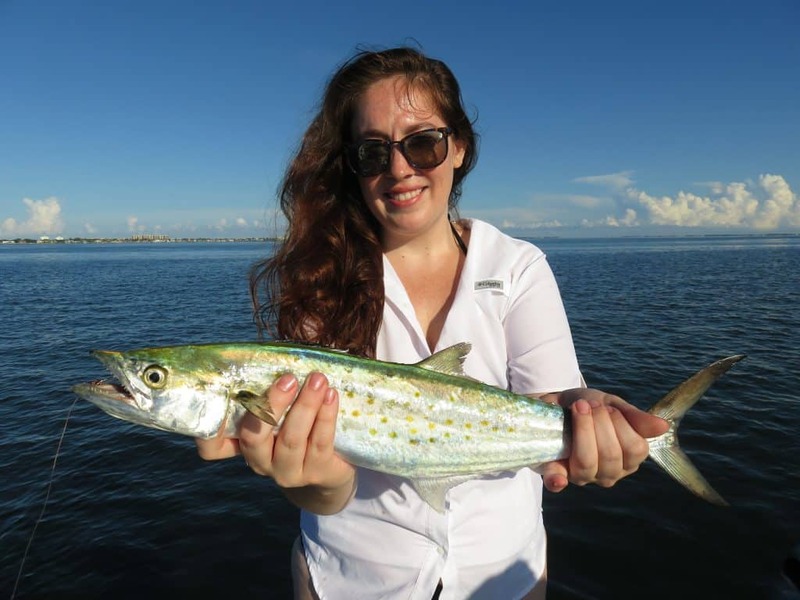 Anglers seeking to catch Spanish mackerel on fly can easily do so. A 7wt outfit works well. Both floating and intermediate sink tip lines will be fine. Spanish mackerel are easy to catch when they are working up on the surface. A white D.T. Special fly tied on a long shank hook is effective and will reduce cut-offs. Both artificial lures and live baits are extremely effective when Sarasota Spanish mackerel fishing. Both have their advantages, depending on conditions. Anglers casting lures can cover a lot of water quickly and also elicit savage strikes from the aggressive mackerel. Live bait is usually a better choice when anchored over structure or when chumming fish behind the boat. Spoons, jigs, and plugs are all effective lures for Spanish mackerel. Silver spoons can be cast a long way and mimic the bait fish that mackerel are usually feeding on. A quarter ounce jig head with a 3 inch Shad tail grub also works well. The grub tail is easily replaced when torn up by the toothy Spanish mackerel. Plugs are also very effective, though a bit more costly. 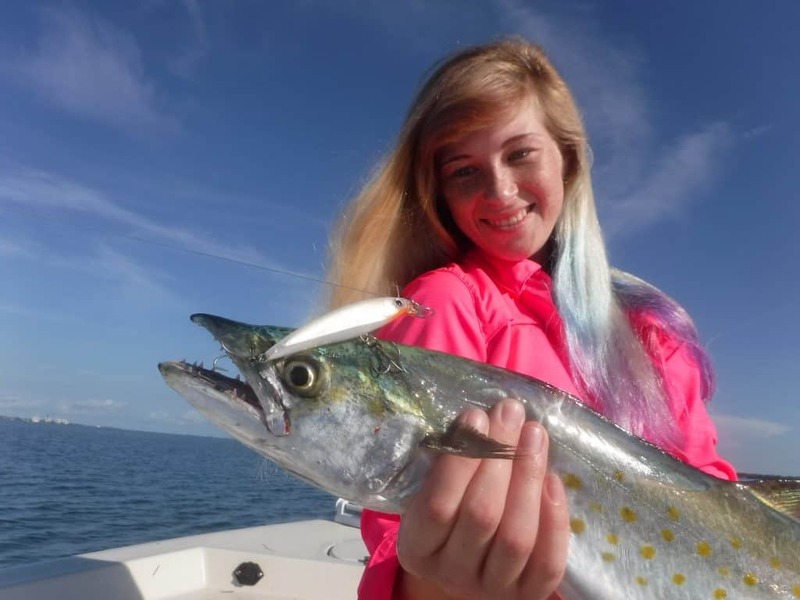 Anglers need to be prepared to lose some lures, it is just part of fishing for Spanish mackerel. Live bait certainly accounts for many Spanish mackerel being caught. Live shrimp is probably the number one live bait, as it is available at bait shops year-round. Small live bait fish such as pilchards, threadfin herring, and sardines can be extremely productive baits. Cut bait will catch plenty of mackerel as well, especially if it is fresh. Spanish mackerel require a high level of salinity. Therefore, they are found in the Atlantic Ocean, Gulf of Mexico, and inshore waters close to inlets and passes. Inshore bays, passes and inlets, in the inshore waters of the Gulf of Mexico and Atlantic Ocean are the prime areas to target Spanish mackerel. They are often targets on a Sarasota fishing charter. The most effective technique when targeting Spanish mackerel in the inshore bays is to drift over grass flats and 6 feet to 10 feet of water. Anglers can cast artificial lures such as spoons, jigs, and plugs as they drift along with the tide and wind. The best approach is to cast with the wind ahead of the drifting boat. Mackerel prefer a fast, aggressive retrieve. Fish can often times be seen working on the surface. Bird activity is another good sign that Spanish mackerel are present. Anglers can also drift a live bait behind the boat when drifting the inshore flats. A # 1/0 long shank hook works well and will help reduce cutoffs. A live shrimp or bait fish is simply hooked in the front then cast out behind the boat and allowed to drift naturally. If the current or wind is strong, a small split shot may be required to get the bait down in the water column. Chumming is also a very effective technique on the inshore flats. Both frozen chum and live chum can be used to draw mackerel up behind the boat. The technique is fairly simple; the boat is anchored up current of a likely flat or spot and chum is added into the water. Blocks of frozen chum can be purchased at most bait shops and work well. Chumming with live bait fish is more complicated but is a deadly technique. Once the fish are actively feeding behind the boat, they will hit both live and artificial baits. On the East Coast of Florida the term inlet is used while on the Gulf Coast we call them passes. They are essentially the same thing, a narrow channel that connects the inshore bays to the open Gulf or ocean. They are both prime spots to target Spanish mackerel. Fish use passes and inlets as highways to migrate in and out of the bays and into the open waters of the Gulf and ocean. Anglers can target Spanish mackerel in passes and inlets using several different techniques. Drifting with the current is very productive. The boat is idled up current of the area to be finished, then the current moves the boat over the targeted spot. Artificial lures work very well in this application, particularly spoons and jigs. These lures are heavy and will sink down in the current. Plugs will work well when fish are seen actively feeding on the surface. Spanish mackerel may be found anywhere in a pass or inlet, but there are a few areas that will consistently hold fish. The mouth of the inlet or pass can be very productive on the last couple hours of the falling tide. Shallow bars that drop off into deep water can produce at any time. Structure such as rip-rap and docks will also hold fish. Many inlets and passes have long rock jetties on either side. These are terrific spots for anglers without a boat to catch Spanish mackerel. In the spring and the fall when bait is plentiful, mackerel will usually be thick in these areas. When the run is on, it is mayhem! Artificial lures are tough to beat in this situation, as at times longer cast will need to be made. A half ounce silver spoon is tough to beat. Many Spanish mackerel are caught in the Atlantic Ocean and Gulf of Mexico within a couple miles of shore. Spanish mackerel are generally caught reasonably shallow, in water around 30 feet deep. Often times, fish can be seen feeding voraciously on the surface. This is one of my favorite forms of fishing! It is great fun casting a lure into a fish feeding frenzy, knowing that you’re going to get a strike. False albacore and other species can be an added bonus. While mackerel can be encountered in open water almost anywhere, structure in hard bottom areas will attract bait. This will in turn attract the Spanish mackerel and other game fish. Artificial reefs and water between 20 feet deep and 50 feet deep are prime spots. Here in Sarasota where I guided fish, we have several artificial reefs just a couple miles off the beach. These are very reliable spots to target Spanish mackerel. Hard bottom areas in the same depths will also concentrate Spanish mackerel. The same ledges that you fish for grunts, sheepshead, grouper, and snapper will hold bait and attract mackerel. Since the spots are generally fairly small, anchoring is often the best approach. Anglers should anchor just up current from the break and free line baits back behind the boat. Live or frozen chum should get the bite going quickly. Trolling is an incredibly effective technique and will put a lot of Spanish mackerel and the boat in a short amount of time. Trolling has several advantages when targeting Spanish mackerel. Anglers can cover a lot of water in a short period of time when trolling. This can be particularly important on days with a little chopped on the surface or when fish aren’t showing on top. Once a school of fish is located, trolling can produce a lot a fish in short order. Finally, trolling is really quite easy to do. Trolling is simply driving the boat around 5 to 7 knots while dragging lures behind. But, as in all fishing, there are nuances and techniques that will improve the success rate. Spanish mackerel prefer lures that are moving at a brisk pace. This means that we have to get the lures down in the water column while still moving along fairly quickly. There are several different ways to accomplish this. The easiest way to get the lure down to the fish is to use a plug with a diving lip on it. These lures float on the surface and as the boat begins to move they dive down to a certain depth. The depth that they dive is determined by the size and shape of the bill. In most cases, a lure that dive down 5 to 7 feet is ideal. Trolling sinkers are another tool that allow anglers to troll for mackerel at the correct speed while getting the bait down to the fish. Sinkers for trolling come in two different styles, torpedo and keel designed weights. I prefer the keel weights. The sinker is tied onto the end of the running line and then a 6 foot to 10 foot piece of leader is attached to the other end. The angler can then use a spoon, plug, or jig on the terminal end. Planers are the third method by which anglers can get their Lors down to the fish. While they do work very well, planers are a bit more complicated. Planers come in several sizes. A number one planer will dive down 5 to 7 feet and a number two planar will dive down to 15 feet or so. A long leader, usually around 20 feet, is attached to the end of the planar and then the lure. Planers have a sliding ring on them which allows the planar to dive down deep when trolled but then trip when a fish strikes. This allows the angler to fight the fish without the added drag of the planar once the planar is reeled up to within a foot of the rod tip, the fish must be hand lined in the last 20 feet. This can be cumbersome but can be extremely effective when the mackerel are down deeper in the water column. It will also produce king mackerel. Several manufacturers produce spoon specifically designed for trolling. The spoons are designed to have a tight wobble at quite high speeds and are extremely effective. They come in multiple sizes, allowing anglers to match the spoon to the size of the bait and the water. They have a large single hook, making it easier to handle than does a lure with treble hooks. I use these spoons for most of my trolling in the inshore Gulf of Mexico. I will troll a #8 Rapala X rap when I see fish working on the surface.